Shastra (Skt. śāstra; Tib. བསྟན་བཅོས་, tenchö, Wyl. bstan bcos) — a treatise or commentary upon the words of the Buddha (Tib. བཀའ་, ka, Wyl. bka’). In Tibet, many of the most important shastras composed by the great Indian masters of the past were compiled into a collection known as the Tengyur, or translated treatises, comprising around 228 volumes (depending on the edition). 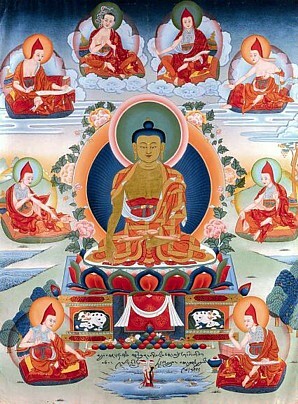 As this says, all the excellent teachings of the Dharma can be included within two categories: the speech of the victorious Buddha and the treatises which provide commentaries on its intended meaning. These two features are not found in other traditions. thinking that even though it is honourable, there are other easier methods or that there is a lack of connection (between the methods and the goal). unlike a treatise on dentistry for crows, for example, generally there is some purpose to it. Furthermore that purpose is achievable, so it is not like a treatise on stealing the crown jewel from the naga king. Not only that, but the aim, which is achievable, is also a sublime aim for individuals to pursue, so it is not like a treatise on how to marry your mother. Then, it is not that the methods for accomplishing this supreme objective bear no relation to what is in the treatise, as in the case of [a text about] sacrificing animals in order to gain rebirth in the higher realms. Of the nine kinds of shastra (Tib. བསྟན་བཅོས་དགུ་, tenchö gu, Wyl. bstan bcos dgu) listed below, only the first, sixth, and ninth are valid and authentic, that is, they are the three kinds of true shastras (Tib. བསྟན་བཅོས་ཡང་དག་གསུམ་, tenchö yangdak sum, Wyl. bstan bcos yang dag gsum); the other six are to be discarded. ↑ Dilgo Khyentse Rinpoche, The Heart Treasure of the Enlightened Ones, Note 10, page 215. Also see The Heart of Compassion, page 197. This page was last edited on 23 November 2018, at 13:27.